Book also available, please see our book section. The Great Mother of all mantras, the Gayatra is an ancient Sanskrit sound vibration which evokesthe Divine Sun of Life to enlighten and purify us. This chant was recorded at the precise time of the SummerSolstice, when the solar power of the sun is at its peak for the entire year. ""Gaya"" means lifeforce and ""tri""stands for protector. Repeating the Gayatra bathes us with a potent protector shield of our life force. Theopening vocals which become the underlying background for this chant, were received during meditationupon the Great Seraphim - the High Order of Celestial Angels who are Carriers of the Holy Fire and assistone's travel to the Higher Realms. This chant of exaltation is sung by the celestial choirs at the feet of the Throne of God. It embodies thehighest of frequencies which extend the grace and holy protection to the chanter. It sets up aresonance with Divine Love energies in whose presence lesser forces cannot remain. It providesDivine Attunement with the Masters of Light and establishes sacred space. Sanskrit for ""I honour the Divine within."" This mantra pays homage to our inner God Presence, aligning uswith love and guiding us to be true to our inner self. YHVH is the sacred tetragrammaton, the four sacred Hebrew letters which stand for the holy name of God.YOD represents the creative, masculine principle; the fire of the Will of Spirit, the Father. HE representsthe Divine feminine principle; the Shekinah Glory, the Cosmic Mother. VAV is the son, the regeneratingpower of the Love Light. The second HE is the daughter, the Heart and the Breath of Life. ""Hail to the Jewel in the Lotus""
This is the beautiful, timeless chant of the Avalokiteshvara, the Buddhist Bodhistava who oversees all livingbeings with great compassion. It embodies a tremendous vibratory field of love. The vision held during thischant was that of the Mother of the World, sitting high on a Himalayan mountainside, transmitting loveradiations from her heart to all humanity. This crystal bowl meditation was recorded during the Wesak Full Moon, the time of greatest contact for theyear - when Humanity, the Hierarchy and Shamballa energies are linked and potent energies are released.This ceremony was performed with a circle of seven crystal bowls. It is offered as a means for attunementwith the Seven Great Rays, the creative forces behind all manifestation. Each Ray embodies qualities ofthe Divine Nature; an alignment with these values inititates an expansion of consciousness. As the soul navigates its journey through the Higher Reams, it follows a series of elemental sounds, eachsound acting as a guidepost to designate a specific spiritual region. Many of these sounds are mirroredhere on earth through the purity of nature. Riding on the sound currents of a crystal temple bowl and didgeridoo, we embark on a sound journey .... greeted by crickets who serve as guardians, we encounterbird song, gongs, crystal wind chimes, the fire of transformation, a purifying mountain stream which flowsto the boundless ocean where the whistle of ancient Peruvian Vessels sends out a call to all souls toremember their true origin. 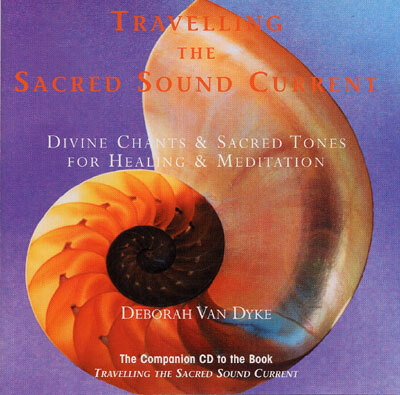 ......A pure treasure of ancient chants and mantras, crystal bowls, drum, didgeridoo, nature tones, Peruvian whistling vessels and meditational ceremony, providing a deep sound experience for inner attunement, healing and meditation..